With the U.S. Open tennis tournament now in full swing, I thought it would be a good time to post this. I've been a tennis fan for a long time and enjoy playing the game recreationally. Every time I watch matches during a tennis tournament, though, it also makes me think of dueling with another player over the chessboard, not just about what's happening on the court. The value of seeing chess as an art has been mentioned before here, including the idea of it being a mental martial art, along with comparisons to other arts such as music. I think looking at chess as a sport can be similarly interesting and useful, with the ongoing Olympiad in Istanbul being an excellent example of how it can embody the sporting philosophy in world competition. In some respects chess and tennis are obvious comparisons as sports, as the most popular form of tennis (singles) is also a one-on-one duel. 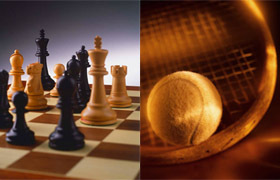 There are in fact a number of aspects of tennis that have close equivalents in the sport of chess. Each game/match tends to develop a rhythm between the two players. There is normally a natural ebb and flow between attacking and defending phases for each side. Critical moments also often occur which offer a player the chance to make or break a game. One side is given a small but real advantage in terms of initiative. Being on serve in tennis is intriguingly like the benefit of being White, which sometimes creates pressure to "hold serve". However, in both sports a player will have to alternate sides and must have a complete game in order to be successful in tournaments. Players have different playing styles, although at the top levels the styles tend to converge towards what provides the most practical results. One could liken swashbuckling gambit play in the Romantic era of chess to the serve-and-volley style of play in tennis; both have now disappeared from the top echelons of their sport as a dominant style, but are still crowd-pleasers when occasionally resorted to. Players exchange moves/shots and move/shot selection is always important on a tactical level. Sometimes a player has to make a defensive choice because of their opponent's previous move, while other times a player can choose to play more aggressively (and riskily) or more conservatively. In both sports, aggressive and risky play generally leads to more more wins/winning shots, but also more losses/unforced errors when your opponent successfully defends. Endurance over the course of a game/match is important. Strong play in the beginning is good, but if a player weakens over time, their good initial results may disappear and be overtaken as their opponent outlasts them. Tournament results can fluctuate wildly even with top-ranked players. This year Serena Williams did terribly at the French Open and then won Wimbledon in crushing style, to cite just one example. Aside from the game mechanics, the pivotal role of psychology and mental training is also a shared focus for both sports. Having to overcome an opponent's intimidation factor (higher rating/ranking or poor previous match results against them), manage the pressure of a tournament as it progresses, and avoid anything that distracts you from your game are all key factors in players' success or failure. Even players who are top ranked in terms of skill need that extra mental strength to achieve their goals, as Andy Murray for example has shown. I've posted before on mental toughness in chess and it would be hard to find a chess player who didn't have their own stories of painful tournament collapses or key games thrown away because of their mental state, rather than a lack of skill. Watching a high-quality tennis match gives me much the same pleasure as a high-level chess encounter and seeing players fight their duels is both motivational and educational. There is something that master-level competition can bring out in all of us, a kind of inspiration to compete and succeed, that is the essence of sport. This second-round tournament game features a side variation of the English Four Knights (6...d6) that you won't find in manuals, but is played fairly often in practice, according to the database. The first four moves of the game are full of transpositional possibilities, but White was looking to go into a Four Knights and it seems that Black was happy to oblige. The problem with this side variation, as is usual with deviations from theoretical main lines, is not that it's losing; it's simply not best. In this particular case, it doesn't develop a piece (unlike the main line 6...Re8) and limits Black's mobility in the center and with his dark-square bishop. White makes obvious moves to take advantage of this, kicking Black's bishop back to b6 and then developing with a threat to the kingside with Bd3. At this point, though, White - perhaps focusing too much on the 100-point rating gap in Black's favor - opts for a weak plan of simply trading minor pieces. By move 12, White has negated any opening advantage he had, allowing Black to pass him in development and also handing Black the initiative with threats down the c-fiile. Black for a time presses his initiative well, but then lets up for one move and White is able to almost equalize again. Unable to make progress, Black trades down and enters a Q+2R late middlegame/endgame which White should be able to hold with little difficulty. Unfortunately, after 32 moves of hard-fought battle and feeling the pressure, White fails to fully calculate his 33rd move, again focusing on the illusory simplification of the piece trade and not its consequences. Black then penetrates with his queen and it's all over. Although analysis shows some of my play to have been erroneous or not optimal before the final error, the game was at least a worthy struggle. The problem at the end was can be ascribed to laziness (or tiredness, more charitably). I've seen this happen before in my games, including more recently, and it remains an object lesson. A chessplayer needs to have the mental capacity of a marathon runner, treating all moves until the end of the game as important. Just as importantly, a player needs to have the energy to tackle them appropriately. Sprinting is good for as long as it lasts, but most games are going to go the distance. I'm continuing to work my way through Bronstein's Zurich 1953 International Chess Tournament during my lunch hours at work and recently came across the following game (Szabo-Reshevsky, round 19 game 130 in the tournament book). I have to admit that Reshevsky is one of my all-time favorite players and I always enjoy going over his games. In this one, on move 20 he overlooks that, instead of the obvious recapture on f6 by White, there is a mate in 2 by his opponent after Qxg6+. Szabo however also overlooks this and Reshevsky then eliminates the Bd5, which was the source of the tactic. According to Bronstein, Szabo then realized his mistake and was thoroughly shaken for the rest of the game and for some time afterwards in the tournament. This is another simple, clear example at the professional level that highlights the utility of CCT (Checks, Captures and Threats) in the thinking process. There are two possible checks on the board for White on move 21. Bxf7+ can be calculated very quickly as not working, while Qxg6+ can be calculated almost as quickly as leading to the mate. Because the g6 pawn is optically protected by the f7 pawn, but is not protected in reality due to the pin on f7 by the Bd5, the capture with check is a non-obvious move unless the pin is explicitly recognized in the thinking process. The "obvious recapture" on f6 is another distraction from recognizing the critical tactic. The benefit of CCT comes from literally forcing the player to recognize this type of critical tactical element, which as we see from the game can otherwise be overlooked, even by world-class players. Once Qxg6+ is contemplated, it immediately becomes apparent that fxg6 is impossible. This requires very little expenditure of calculating time and energy, in exchange for a great reward. Move 7, where Black could have played less stereotypically and obtained an advantage in the center. Move 12, where Black should have thought twice about moving the rook off the h-file instead of automatically castling. Move 13, where Black could have opened up the center to his advantage. In the middlegame, a premature pawn thrust from White is mishandled by Black, who could have obtained an easy game by redeploying the Nf6 to a better square. This inaccuracy was however offset by White allowing what kingside pressure he had to be nullified. Black on move 23 again passes up the chance to open the center to his advantage, focusing only on the immediate material gain of a pawn. As a result, the kingside and center become closed and play shifts to the queenside. Black is too slow in redeploying his forces, however, and White gains a winning advantage before missing the best continuation and sliding into a draw. Recent posts have highlighted the importance of CCT (Checks, Captures and Threats). Here, White could have won the game by using CCT as part of his thinking process on move 37. There are only two captures on the board and one wins by force (Bxa6), as the resulting series of recaptures ends with a knight fork. Once you consider the possibility of Bxa6, the rest is actually rather easy to see and calculate. However, the pawn is "obviously" protected and if a player does not force themselves to consider non-obvious moves like that, they will be overlooked. The previous example featuring a calculation error that could have been avoided using CCT (Checks, Captures and Threats) showed how considering all checks - in that particular case, just one check was possible on the board - could have won the game. This next example is from round 9 of the Biel super-GM tournament and illustrates the second C (captures) part of the thinking process. See what happens on move 30, when White (Etienne Bacrot) fails to consider all possible captures by Black. The Re1 is protected, so evidently GM Bacrot did not bother to calculate its possible capture. White's multiple hanging pieces, however, means that this was an immediately losing oversight. When constructing a practical thinking process, I used as a centerpiece Checks, Captures and Threats (CCT). This simple idea - beginning any search for candidate moves with these three categories of forcing moves, in the order presented - in fact can have a huge impact on your ability to find "hidden" or non-obvious move possibilities in a position. CCT should therefore be applied both to identifying your opponent's possible threats (ideally right after he/she moves) and to your own candidate move selection. The previous linked post goes into more detail on the overall thinking process, for those interested. Of course, a thinking process is only effective if it's actually used. Some of my recent games have reinforced this fact to me, as it's all too easy to fall back into bad old habits of only actively considering "natural" appearing moves and not looking past things like "obvious recaptures" as occurred in Annotated Game #57. Breaking old (bad) habits is only possible by constructing new (good) ones to replace them, so I'm making an effort to consciously apply the thinking process and especially CCT. Missing good opportunities for onself (or an opponent's threats) is otherwise all too easy. Being dismissive of the need, or simply being too mentally lazy to apply CCT, has been an issue for me in the past. One of the ways I'm trying to combat this tendency is by selecting professional examples of where the use of CCT would have changed the outcome of a game. It's also a useful reminder for the improving player that sometimes failure does not mean you are doomed to chess purgatory forever; even the top levels of professional chess are susceptible periodically to making these types of errors. The first example is the following game from round 1 of the recently-completed Super-GM level Biel tournament. Watch what happens on move 33, when it becomes obvious that neither Morozevich nor Giri had done the first C in CCT. Morozevich would have immediately obtained a winning advantage by playing the only check available to him on the board, had he considered the move. Prior to resuming my tournament game review, I wanted to look at the following "revenge" game played against the "Turk" Chessmaster personality, who in Annotated Game #56 had thrown me off my game by opening with 1. g3 and transposing into a King's Indian Attack. Although it ended up in a draw, I should have been able to get the win. This game I was White and knew enough about the English Opening to be able to quickly punish Black's 2...b6 approach after he opened with 1...e5. White ends up with a pawn and the initiative out of the opening, able to rely on a strong center and open lines to use against Black's uncastled king. A key attacking opportunity employing a pawn sacrifice is missed by White on move 21, although there were some other attacking inaccuracies prior to that which analysis also usefully revealed. White soon afterwards very unwisely delays taking a pawn offered by Black, forcing White to then exchange down in order to neutralize Black's potential attack. Despite being a pawn up when the dust settles, the opposite-colored bishops mean that the game is drawn. Don't stop analyzing prematurely after an "obvious recapture". Look to maximize dynamic piece activity, even at the cost of a pawn or a positional defect, if concrete analysis supports it. Don't trust your opponent; analyze carefully any potential gain of material and don't be deterred from taking it if there is no refutation. When the conditions are right, keep your primary focus on attacking the opponent's king; other considerations are not as important.